Here at HIP Video Promo, we’ve been working hard to promote music videos since the year 2000. It’s important to us to help younger and independent artists get the recognition they deserve, and it’s exciting to be on the ground floor with artists that become household names (and with over 2700 videos under our belts in more than 17 years, there are quite a few). Every Friday, we’ll be sharing a “Flashback Friday” video, where we get to reflect on one of our favorite videos from a few years ago. Here at HIP, a large portion of our business comes from repeat clients, and there’s nothing more rewarding than getting to work with a band multiple times over a period of several years. 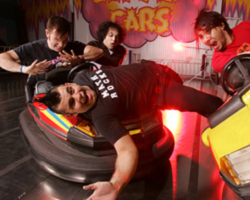 Back in 2006, we partnered with Long Island pop-punkers Patent Pending for the first time to promote their video for “This Can’t Happen Again.” The band had released their debut full-length album, Save Each Other, the Whales Are Doing Fine in June of 2006, following which they spent the entire summer on the Vans Warped Tour. That fall, we shared their video for “This Can’t Happen Again”, which sees “P-Unit” use their DIY ethics to throw a blast for the camera, while frontman Michael Ragosta tells his story. “This Can’t Happen Again” was directed by Benny the Whale, who also costars in the clip. Like everything Patent Pending does, the energy is full-speed ahead, and so is the heart. Since 2006, we’ve returned to work with Patent Pending on several more videos. We promoted the cheery “She’s A Ho Ho Ho Merry Christmas” in 2008; the following year, after the release of the Attack of the Awesome!!! EP, Michael Ragosta left the band and his brother (and previous guitarist) Joe Ragosta took over on lead vocals. Since then, we’ve shared the moving “One Less Heart To Break”, the zombified “Dance Till We Die”, and the hilarious “Douchebag” in 2011; the romantic “Spin Me Around” in 2012; and most recently, the splatter-painted clip for “Wasted / Wake Me Up” in 2017. “Wasted / Wake Me Up” comes from Other People’s Greatest Hits, a ten track cover album on Rude Records that followed their 2015 full-length Riot Hearts Rebellion. What a thrill it’s been to see this band blossom and continue to grow, and to have part of their team along the way for so long! When they’re not in the studio, Patent Pending are on the road (in addition to more than one summer spend on Warped Tour, they’ve shared the stage with everyone from Simple Plan to Bowling For Soup! ), and if there’s any band to see in concert, they’re the ones. Their live shows are guaranteed to make you laugh (“Anti-Everything” is accompanied by a 90s “boyband” dance routine), cry (“One Less Heart To Break” is a guaranteed tear-jerker), and have a TON of fun (singalongs, stagediving, crowdsurfing, etc. are plentiful!). Most recently, they toured the UK with Waterparks; while they haven’t announced touring plans for the US just yet, we wouldn’t be surprised if they have news to share soon. Check out their website for all updates! We’ve been big fans of Patent Pending from the start, and we can’t wait to see what they do next! We can’t wait to see who becomes the next break-out artist. Do you think your video has what it takes to be the next break-out smash hit? Get in touch with Andy Gesner and the rest of the HIP Video Promo team by giving us a call at (732)-613-1779 or emailing us at info@HIPVideoPromo.com.